Primary Natural Resources phosphates, coal, manganese, bauxite. 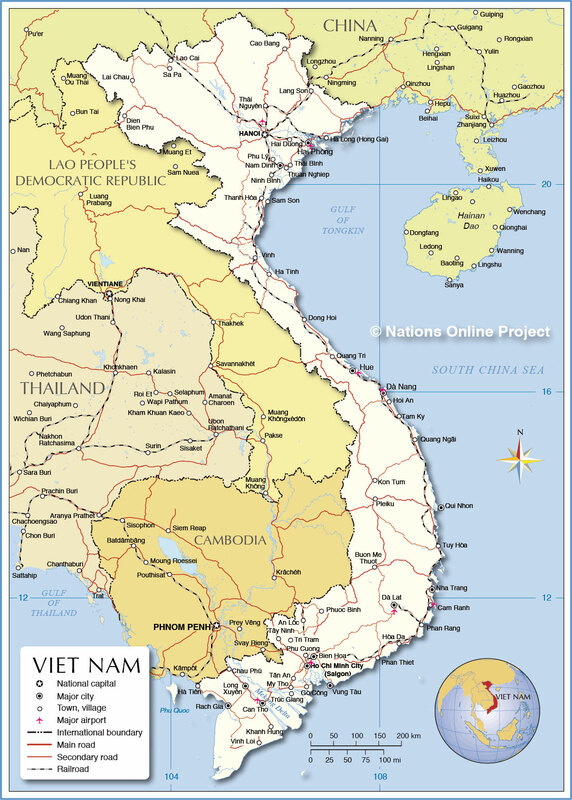 THE SOCIALIST REPUBLIC of Vietnam was formed into a single country in 1976 when the North and South Vietnam states were united after the withdrawal of American military, which had been engaged in an anticommunist war since the early 1960s. 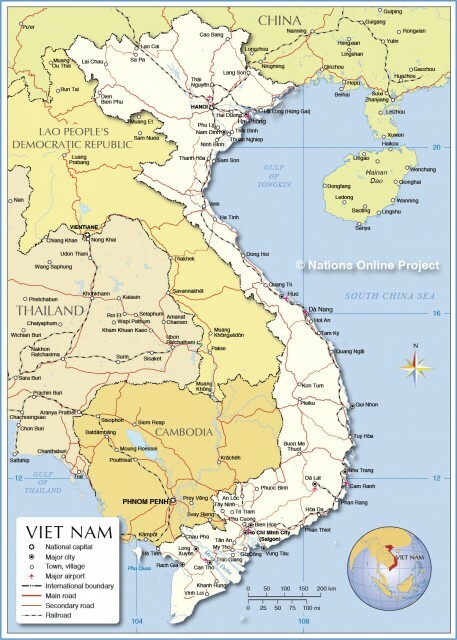 Vietnam has an elliptical shape that spreads for 1,905 mi (3,219 km) in a north-south direction. It is located in Southeast Asia, at the easternmost part of the Indo-Chinese peninsula. To the west lie LAOS and CAMBODIA, and CHINA is to the north. Vietnam has a long coastline to the east adjoining the China Sea. The Annamite cordillera to the west and Northern Highlands are the most important mountainous areas of the country. The mountains, in general, are rugged and heavily forested. The Red River valley and delta of the north are joined by a narrow north-south coastal plain with the MEKONG RIVER delta in the south; these are essentially agricultural areas. The northern part of the country has a marked winter season. Hanoi, the capital in the north, has an average January temperature of 62 degrees F (16 degrees C), but the south has little monthly variation, with a year-round temperature around 80 degrees F (26 degrees C), like that of Hanoi’s summer. The heaviest annual rainfall, over 120 in (305 cm), occurs in the central part of the cordillera, but Ho Chi Minh City (Saigon) in the south and Hanoi receive 77 in (195 cm) and 69 in (175 cm) of precipitation, respectively. Vietnam’s Bronze Age civilization dates back to 300 B.C.E. The Chinese conquered the Red River Delta in 207 B.C.E. and ruled until 939 C.E., imparting significant elements of Chinese culture. An indigenous power of the Chams (Kingdom of Champa) thrived in the west coastal plain from 192 through 1471. The powerful Viets of the Red River Delta migrated southward overpowering the Champs and settling all the way to the Mekong delta. One-fourth of Vietnam’s population lives in urban areas. Ho Chi Minh City is the largest urban area with a population of 4 million; Hanoi has 3 million. The major religion of the people is Chinese Confucian Buddhism, though state-sponsored atheism is widely followed. The government is run as a one-party-rule in a socialist system where the Communist Party controls both the political and the economic apparatus of the country. Recently, some elements of market economy have been introduced despite some government leaders’ apprehension. Vietnam is mainly an agricultural country, with 63 percent of the population engaged in some form of farming. Industries are located mainly in Ho Chi Minh City, Hanoi, and Haiphong areas. Vietnam is a poor country; 37 percent of its population lives below the poverty line.